This is the cabin itself, vacuum packed for transport and as a weather resistant barrier. 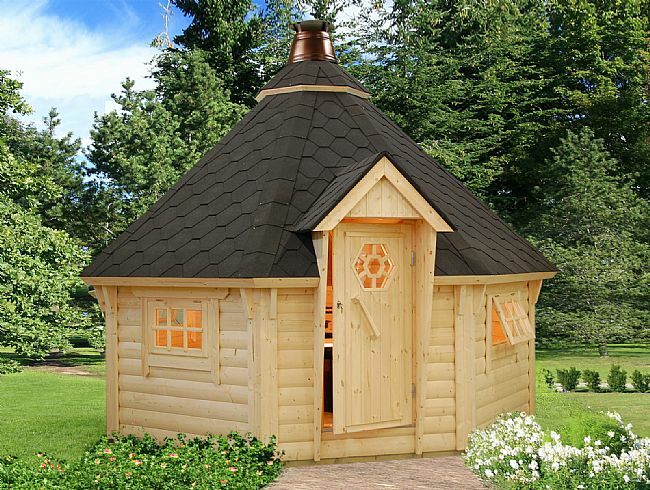 It is neatly packed and contains all the logs and pieces needed to build your log cabin. All our buildings are manufactured from high-quality Nordic kiln-dried spruce. Long cold winters and short summers, are characteristic to the region, which in turn creates a slow growth rate of timber, meaning it is strong, long-lasting and durable. We value highly the aesthetic aspects of spruce; its fresh light Nordic hue and small knots. All our cabins have different thickness logs which will be highlighted in the specification, this log thickness is the thickness of the wall giving excellent U values. 28mm = 2.6w/m2k & 44mm = 1.98w/m2k. Both the roof and floor boards are made from a 19mm Tongue and Groove. The boards lock together and are fixed in two places to ensure there is no cupping. We do not use any flimsy sheet material in any building leaving you in the knowledge that the cabin is made from the highest quality and attractive timber. All of the boards are put through a rigorous selection process where a laser will assess the all the imperfections and discard any timbers that do not meet our high standards. Double glazed units provide that extra bit warmth and protection from the outside elements. Our double glazed units are a 3mm float, 6mm void and 3mm float. The bearers are the part of the cabin that touches the buildings base. With this being the case they are treated to give added protection and durability. Every cabin comes with the facia boards to finish the cabin, as standard. The style depends on the design of the building. For larger cabins we use a 20x125mm board, smaller cabins generally use a 20x100mm board and the more decorative buildings have a waved facia board. If you need to know which your cabin comes with then the display picture of each cabin is fairly accurate. Alternatively you can contact a member of the sales team and they will be able to assist you. As standard our cabins come with a cylinder lock with two keys, adjustable window and door hinges, aluminium handle plates, window stays and keeps and an aluminium threshold plate. The full fixing kit is provided for a quick assembly. Storm proofing bars are essential in keeping the building together in high storms and extreme weather conditions, they are grooved to allow the building to move and swell through-out the seasons. They are bolted in place with the bolts from your fixing kit. Our expert fitting team can fit your cabin for you giving you piece of mind and the knowledge your building will be built to the highest standard. Regretfully we can only fit buildings within our regional delivery area, if you are unsure whether you fall in this area please give your local office a call . If you choose to have the building fitted then we will contact you after checkout and arrange a fitting date that is mutually convenient. This is usually around 6 weeks from order date. To ensure your cabin is cosy in the winter and cool in the summer you have the option to insulate the roof and floor. The roof is insulated with a 25mm foil backed solid foam board which sits inside a framework of a 25x50mm pressure treated batten. It is then covered by a 12mm ply board. The shingles are then fixed on top of this, this makes the roof a finished thickness of 56mm providing a water tight and thick barrier from the cold and beaming sun. To ensure your cabin is cosy in the winter and cool in the summer you have the option to insulate the roof and floor. The floors are insulated with a 25mm foil backed foam board, these are held up against the bottom of the floor boards with a 19x38mm batten. This also creates a void which allows air to circulate keeping the floorboards ventilated and dry. It is then capped either end with a 20x70mm treated board. Hexagon felt shingles are a self-adhesive, strong and durable roofing material, unlike traditional roofing felt these are a high end long-lasting solution. They are applied in 900mm strips and fastened in place with a heavy duty staple. It creates an attractive honeycomb, hexagon effect. This is then finished with a rectangular ridge tile protecting the ridge of your building. Unlike some companies we like to tell you exactly what you need, without hiding any extra costs. All additional extras are optional and are highlighted above. So what do you get as standard in this package? Split the cost of your cabin into monthly payments. Put down a ten percent deposit and pay the rest off over six or twelve months, interest free. For more information click on the blue finance logo. At checkout simply choose the finance option and follow the on screen instructions. Please note that fitting is excluded from finance agreements and will not be invoiced if selected. We now offer a factory dipped pre-treatment as shown above in the optional extras. Click on the info button next to this extra for more information on this. You can also treat the building yourself by purchasing a preservative and painting the building by hand once either before or after erection. Simply click on here to see the available preservatives. In all cases you will need to purchase a paint to apply to the building once it is up. Painting is very important as it will seal the building protecting it from the weather and extending its life. Our recommended paint can be found by following this link paints. What does it get put on? Having a level base is essential for your cabin. It means that all the logs slot and stay together without hitch, the windows and doors will be level and open without snagging. It also means the building will also settle in unison over time. We recommend that the buildings are placed on a concrete pad, however in certain situations we understand that this is not possible so therefore decking or a decking sub-frame can be used. This is fine as long as the below rules are followed. Have a tolerance of no more than 5mm over the whole building span. Be flat, level & square. There should be no run-off, unlike a patio or driveway the base must be completely flat. The base must be the exact size of the base of the cabin; if you are unsure ask a member of the sales staff, or alternatively the base size is listed in the brochure. So, how is it put together? Free Delivery on this cabin! Please note any coloured pictures of the cabins are for demonstration purposes only, your cabin is supplied in a "whitewood" colour.